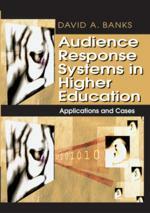 This paper explores the theoretical framework needed to explain observed effects of classrooms in which instructors use audience response systems. We consider how current theories of audience response systems cannot adequately explain students’ initial resistance to the introduction of response systems, or the emergence of a sense of classroom community. We propose a sociocultural reinterpretation of the networked classroom in which learning is described as a process of transforming participation in classroom activities. We use sociocultural theory to help explain students’ changing motivations for participation in class, and the development of scientific concepts through discussion. Finally, we propose some initial hypotheses and approaches to studying audience response systems in higher education within a sociocultural framework.